After resisting the urge to order Chinese takeout all weekend, I decided to find a recipe to create it myself. The one I found uses cornstarch as the breading on the chicken as a lighter alternative to the heavy deep frying that restaurants do. The recipe took about 30 minutes to make and yielded about 4 servings. Starting with three boneless, skinless chicken breasts, I cut the fat from around the edges and created nugget-sized pieces, about 1/2 inch thick and roughly an inch in width and length. I set those aside and chopped a green bell pepper, a red bell pepper, and half an onion into about inch pieces. I began creating the sauce in a medium-sized sauce pan, combining sugar, apple cider vinegar, ketchup, soy sauce and garlic powder and bringing to a simmer. In a small bowl, I combined 2 tablespoons of cold water with 1 tablespoon of cornstarch until dissolved; added this mixture to the sauce and left on a low simmer. To coat the chicken in cornstarch, I put the chicken pieces in a Tupperware bowl with the corn starch, sealed the lid on and shook the container until they were all evenly coated. Once coated, I added to a large pan drizzled with olive oil, and sautéed the chicken for about five minutes before adding the chopped vegetables and sauce. I started sautéing the vegetables in a different pan during the first five minutes the chicken was cooking, but this isn’t necessary! I sautéed together for about 10-12 minutes before serving. This would have paired wonderfully served over brown rice. 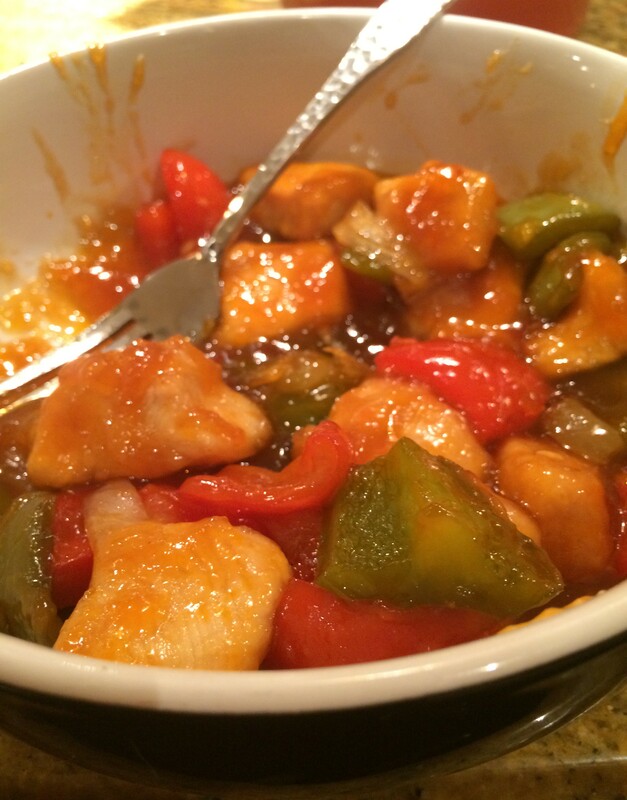 The next time I make this recipe, I would try find an alternative to the sugar in the sauce. I would use a healthy sugar substitute like Stevia and use less of it in the sauce. Personally, I would have preferred it just a tad less sweet, so using less Stevia and adding a pinch of flour to thicken would have been the way to perfect it. Overall, this recipe hit the spot after a weekend full of craving takeout and I’m excited to recreate this dish again for my family! 1. Trim fat from chicken breasts and chop into nugget-sized 1 inch pieces in about 1/2 inch in thickness. 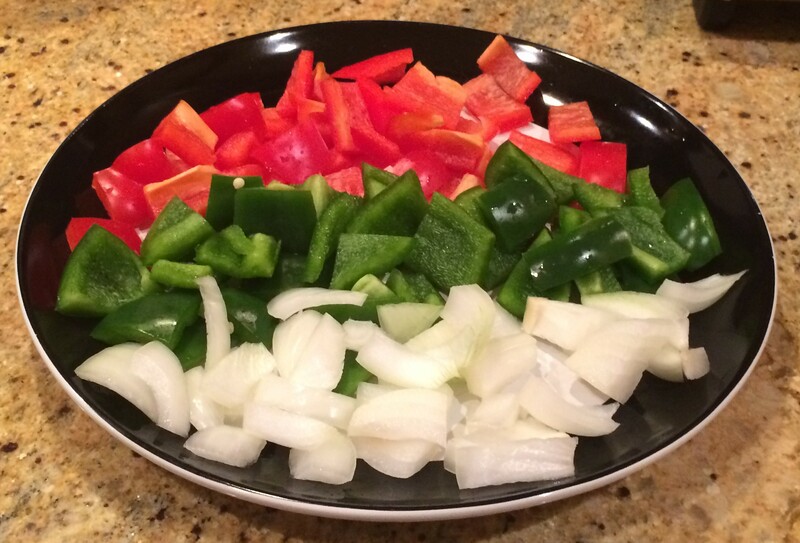 On separate cutting board chop green and red peppers and half a white onion. 2. Combine sugar, ketchup, soy sauce, garlic powder and apple cider vinegar to a medium sauce pan and begin to boil. Whisk together 1 tablespoon cornstarch with 2 tablespoons cold water until dissolved. Then add to sauce mixture and allow to simmer over low-medium heat. 3. 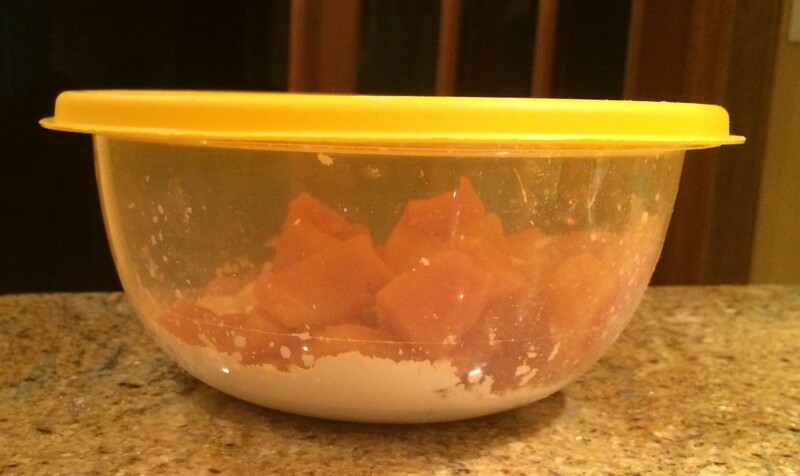 Put cornstarch and chicken in a Tupperware bowl with the lid on and shake generously to coat chicken. In large frying pan, drizzle 3 table spoons of olive oil and allow to heat before adding chicken. Sauté chicken alone for five minutes before adding vegetables and sauce. 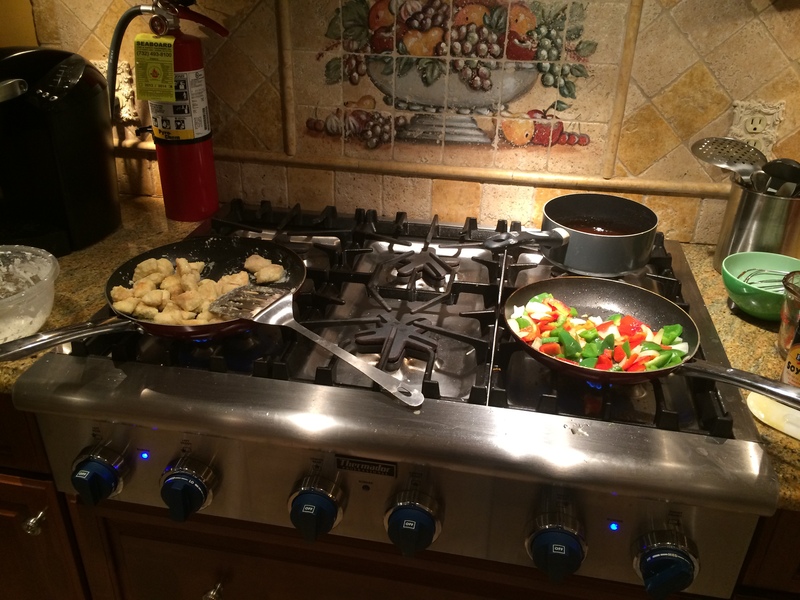 Sauté over medium heat for about 10-12 minutes, until chicken is cooked through.